As thrilling as travel may be, there’s nothing like returning to the familiar, private comfort of one’s own home. But what if you could enjoy the beauty of an exotic locale without ever leaving your living room? One aging husband and wife in Port Arthur, Tasmania, hold that rare privilege. Their recently constructed home, designed by Room 11 Architects, commands jaw-dropping views of rugged Tasman Island and the peaceful Southern Ocean beyond. “The clients were interested in consolidating the considerable potential of the site, specifically its spectacular scenery,” architect Nathan Crump says. 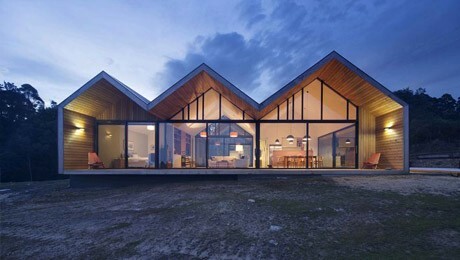 The firm achieved this by installing floor-to-ceiling windows across the entire eastern length of the dwelling, offering a dreamy panorama of the Australian coast. The Lookout House, as the architect dubbed it, gives a whole new meaning to armchair travel.